Last week’s Brand Breakfast was a great demonstration of how branding has become increasingly important across the sector. Not only did we have a packed event, but a waiting list. 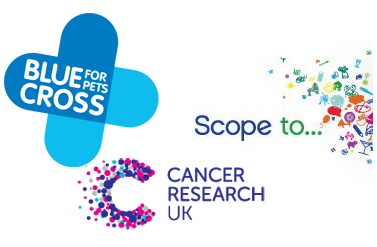 And we didn’t have just one presentation or even two, but three from Scope, Blue Cross and Cancer Research UK. What I enjoyed most was how different each presentation was, and how they highlighted different things, even though each speaker was given the same brief (to present why they rebranded; how they rebranded; the impact and top tips). Here’s what stood out to me most. Devia Gurjar, Head of Brand and Marketing at Scope, was refreshingly honest that their well-planned process hadn’t always gone according to plan, and that they’d deviated from their multi-page spread sheet. Devia championed the need to embrace change and even to take risks. “You can’t be prepared for everything”, she said. “You need to be brave and take a leap of faith, especially when it comes to creativity”. The best thing for me about the Scope rebrand is the co-creation and the fact that the illustrations and stories of people affected by disabilities run throughout it. The brand is a platform, enabling people to have a voice and tell their personal story. An explosion of opportunity. Be prepared to review and explore the flexibility within the brand to ensure it works for different departments without losing its integrity. Debbie Curtis, Head of Communications, and Andrea Fraser, Head of Creative Services, from Blue Cross focussed more on the rigour of the process they’d been through together with The Good Agency. Debbie and Andrea highlighted how important “the science” and evidence had been in convincing staff – and crucially Trustees – of the need for change. It was the robust research conducted that enabled them to stay on track and get the big decisions passed, including whether to change the charity’s name or not, as well as fundamentally changing their style of language to be friendlier, stopping the use of the term “companion animals” in favour of “pets”. They were also keen to highlight how their brand development had taken fundraising into account throughout, including choosing emotive photography with “the aww factor” to help encourage more support. Fellow Brand Breakfast founder Serena Donne, Head of Brand and Creative, explained all the elements that make up the new Cancer Research UK brand, strategically (the vision, mission, positioning, personality and beliefs) and creatively (logo, colours, icons and photography). But the real focus of Serena’s presentation was the importance of staff engagement as a passionate advocate of the “Inside Out” approach to charity branding, which I wholeheartedly agree with. The passion found within charities means that the resistance to change can be immense. Taking your staff on the brand development journey with you is essential in promoting a common sense of purpose, pride and commitment. Serena’s presentation was packed full of the internal engagement devices Cancer Research UK implemented from a regular blog to a brand-related newspaper the pioneer, from a regional tour (ending up at their London HR rather than starting there) to a network of brand champions with their big “brand know-it-all” badges. Serena even drew a huge spider diagram on the big window by her desk to illustrate the progress of the project. Dan is one of the sector’s leading brand strategists. He has worked on brand development across all sectors including Rightmove, London 2012 and Cancer Research UK. He's best known for his award-winning work across all corners of the charity sector, including Shelter (Design Week Award), Parkinson’s UK (Design Effectiveness Award), RSPB (Third Sector Excellence Award) and Scope. Dan established CharityComms Brand Breakfast, proudly supported by The Team, and is an author of our best practice guides to branding and integrated communications.